Interview with a Swiss graphic designer and teacher, father of Swiss Graphic Design Josef Müller-Brockmann (1914-1996), talking about the poster Schützt das Kind! (Protect the Child) created in 1953. Q: Hello, I’m Anastasia Tarkhanova. Today we have a great pleasure to interview a very influential figure in Graphic Design, Swiss graphic designer Josef Müller-Brockman. Firstly, I would like to thank you for finding time to come and speak with me today. I feel very fortunate to have this opportunity to meet you and talk about your works. Your works and writings have inspired me and taught a lot starting from my early years in university. A: It is pleasure for me to be here today and I am excited to tell you more about my works. Q: I would like to talk with you about your public awareness poster Protect the Child. Your works often utilized the combination of typography and photography as means of visual communication. When did you start to imply the use of experimental photography and typography in your posters? 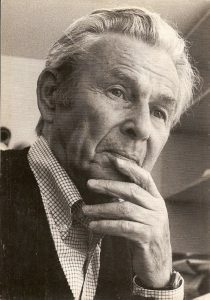 A: I started sharing a studio with photographer Ernest A. Heiniger in 1953. We worked together and also collaborated with Serge Libiszewski, who was a part of “Subjektive fotografie”—new German discipline at that time. In the process of creating this poster, I experimented with different effects that photography can offer. In this case, I decided to use extreme close up of motorbike wheel to create a visual drama and communicate the danger of reckless driving. Q: Most of your previous works had a clear geometric positioning, math-based construction technique. It seems that in Protect the Child you’ve used distinctly different techniques by adding photographic elements, which become the main composition elements. Can you comment on that? A: At first glance, the geometric relations are not apparent, but in fact, the size and location of each graphic element are logically thought out and have a very strong math-based foundation. 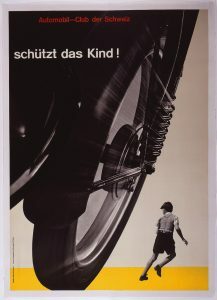 The visual center of the poster is the center of the wheel, the axis leads the viewer from the wheel to the child, which implies the danger and warns parents to keep track of their kids. The figure of a boy takes around one-third of the length of the wheel and is positioned on a parallel diagonal, creating a balanced communication between two elements. Every element of this poster has a reason for its size, proportion, and position, that is how I achieve visually strong and dynamic composition. Q: What about the color scheme: is there a specific reason you chose to imply a yellow line on the bottom and red typeface on the top of your poster, using only black-and-white tones as the main scheme of the poster? A: Absolutely everything should have a distinct purpose on the page – anything that doesn’t indicate the message you are trying to convey is, in my opinion, useless. I believe that a designer should master a meaningful use of colour in order to achieve a rational and successful communication. The use of yellow colour suggests connotations of hazards and dangers, whereas the use of red colour in the text indicates the viewer the importance of provided information on the poster. A high contrast colour scheme and a reduced amount of colours help keep the design clean and the message clear. Q: Absolutely. I believe focusing on essential elements to get the message across really helps, not only to bring the awareness to the audience of the danger, but also to persuade people to act. Do you ever rely on your intuition and sensibility to create your work? A: Before I decided to pursue a career as a graphic designer, I was experimenting and exploring my artistic abilities as an illustrator. I tried various techniques and styles and primarily relied on my intuition and creativity to produce an artwork. Later I taught myself how to think critically and objectively, which led to rational thinking, geometric minimalism, and the grid system. Q: If we go back to your poster Protect the Child, could you tell us more about the process of creating this work and maybe your inspiration or sources that helped to make specific decisions? A: I focused my attention on functional typography, photography and geometric composition in order to achieve overall harmony and unified composition. Before I start to implement imagery in my works, I construct a set of horizontal and vertical lines—a carefully measured grid—which helps me to keep everything in balance and achieve a dynamic and strong composition. I used Berthold’s Akzidenz Grotesk typeface in this poster. I believe that the less elaborate the letterform, the more functional and readable it is to the viewer; I prefer an objective, universal sans serif typeface to convey information. I developed my understanding of typography at the Bauhaus and through the ideas and works of Jan Tschichold. I didn’t rely on my feeling and intuition creating the poster Protect the Child, but rather on measurable proportions. My choice to use photographic elements is based on a desire to achieve objective imagery, convey pure information and honest clear communication. Q: Thank you so much for attending this interview and sharing your process work. It was a great pleasure having you here today! A: It was a pleasure to meet you. I wish you all the best! Look at everything in a critical light and be self-critical as well. Never lose the hunger for learning, experimenting and improving in the field that is most important to you. Xue, Yanmin, et al. Analysis of Brockmann’s Posters Based on Geometry of Design. Trans Tech Publications, 2012, http://citeseerx.ist.psu.edu/viewdoc/download?doi=10.1.1.844.9202&rep=rep1&type=pdf. Accessed 27 March 2018.
http://www.eyemagazine.com/feature/article/reputations-josef-muller-brockmann. Accessed 27 March 2018.
https://www.shillingtoneducation.com/blog/josef-muller-brockmann-tbt/. Accessed 27 March 2018. Meister, Joanne. A Firm Turn Toward the Objective: Josef Müller-Brockmann 1948-1981. I Love Typography (ILT), posted on 12 January 2013.
https://ilovetypography.com/2013/01/12/a-firm-turn-toward-the-objective-josef-muller-brockmann-1948-1981/#ft9. Accessed 27 March 2018.